Cisco Systems (CSCO) reported its fourth-quarter results after the bell. The company continued the trend of revenue growth from the past two quarters which is a positive sign for investors. Revenue rose 6% to $12.8 billion while earnings came in at $0.70 per share, both beating analyst estimates. Shares of the networking giant rose above 6% in the extended hours of trading. 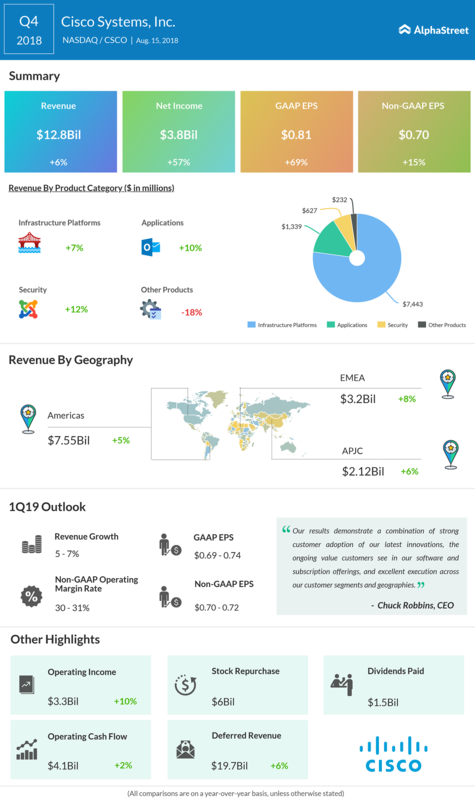 Fourth quarter results bestow confidence to investors as the company’s ongoing transition to move from a hardware-centric provider to a software-based one seem to be bearing fruit. Sales grew steadily across all geographies in the range of 5% to 8% over last year. Operating cash flow remains robust at $4.1 billion, up 2% over prior year. On the products front, the traditional products side saw a jump of 7%, thanks to new products launch which has been well received by customers. Cisco’s new focus areas, software and security-related offerings saw double-digit growth of 10% and 12% respectively, which is expected to grow in the impending quarters as the transition moves to the next phase. Earlier this month, Cisco gobbled up Duo Security for $2.35 billion which would help to broaden its cloud-based security offerings to its clients. Due’s deal is expected to improve the top line in the next fiscal from the security side. For 2018, sales rose 3% to $49.3 billion over the prior year, and adjusted earnings increased 9% to $2.60 per share. At the end of fiscal 2018, product backlog surged 38% to $6.6 billion over last year. On the outlook front, for the first quarter of 2019, Cisco expects sales to grow between 5% and 7% over the prior year. 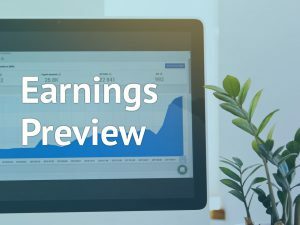 Reported earnings is forecasted to come in the range of $0.69 to $0.74 per share, while adjusted earnings is expected in the $0.70 to $0.72 per share. The guidance includes SPVSS and excludes Duo Security as both the deals are yet to be closed. The company’s stock has risen above 14% in 2018 hitting a new 52-week high of $46.37 in July this year and has seen a 37% jump in the last 12 months.